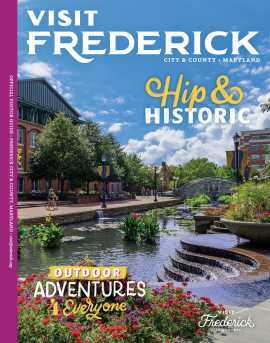 Frederick, MD – On the afternoon of Saturday, April 11, the Tourism Council of Frederick County, Inc. (TCFC) will be joining various partners for a series of public historic interpretive marker unveilings to honor local heroes and veterans of the American Civil War and War of 1812. With recent anniversary commemorative periods for both conflicts, Frederick’s unique contribution of patriotism was highlighted, especially exemplified through her citizenry. Interestingly, two former residents, Francis Scott Key and Barbara Fritchie, have the pen, and not the sword, to thank for their eternal fame in the history annals. Each quickly derived national recognition from works of prose dealing with Union flags under duress (and attack) by the enemy. The National Road and West Patrick Street served home to more than one flag-waving heroine throughout the Civil War. On Bell & History Day, the Barbara Fritchie House and Museum (located at 154 W. Patrick Street) is scheduled to open from 10am-4pm and invites visitors to learn more about the plucky 95-year-old star of John Greenleaf Whittier’s legendary poem. Although historians have questioned the event’s authenticity, Barbara Fritchie was an extraordinary lady who would experience first-hand the American Revolution, War of 1812 and Civil War. While Dame Fritchie quickly became an international icon, a neighbor one block to the west would slowly slip into virtual obscurity after her demonstrating incredible bravery on September 10, 1862. This was Mary Quantrill, a 38-year-old school teacher who confronted the passing Confederate Army with aid from her pupils. Today, Quantrill’s home is the site of McCaskill Financial. Her lesser-known tale will finally be told with the help of an interpretive marker featuring an original illustration by artist Richard Schlecht. An open house will be hosted by McCaskill Financial from 2-3pm, following a public unveiling of the marker at 2pm. Additional partners in the marker’s creation include the TCFC and the Frederick Woman’s Civic Club, who will have the 1807 constructed Steiner House (368 W. Patrick St) open from 10-4pm. The Steiner family was patriotic in their own right, playing important roles in both the Civil War and earlier in the War of 1812. Mount Olivet Cemetery contains nearly 38,000 inhabitants, rivaling the population of our state capital of Annapolis. Among those buried here are Star-Spangled Banner author Francis Scott Key and 108 veterans of the War of 1812. A recent grant from Star-Spangled 200 (the Maryland Bicentennial Commission) helped fund granite/bronze veteran markers and four interpretive waysides. Local chapters of Frederick Daughters of the American Revolution and cemetery staff will host an unveiling of three waysides at 3pm. Local historian and TCFC staff member Chris Haugh will follow with a short walking tour of grave sites connected to both the War of 1812 and Civil War. These will include Francis Scott Key, Barbara Fritchie and Southern soldiers buried within Confederate Row. Here, a final wayside depicting the burial of fallen Confederate soldiers in September 1862 will be dedicated with help from the living historians from the 2nd Maryland C.S.A.